Zebrahead are veterans of the pop-punk scene and they just don't seem to tire with age. With their twelfth full-length album release 'Walk The Plank', the band show how they can still create music that is fresh and full of life. The album begins with 'Who Brings A Knife To A Gun Fight' which promises a roaring album that is full of energy and that's exactly what this track brings. It is intense, and the thundering guitar riffs show how the band have moved towards heavier punk - an apt risk for the band that pays off. The repetitive lyrics such as 'we want to party, party' make the listener just want to rock out. This trend is continued throughout the album, and 'Headrush' is another wild track. With rapcore elements that start the song off and even more resounding guitar riffs throughout the song, you can't help but stamp your feet. 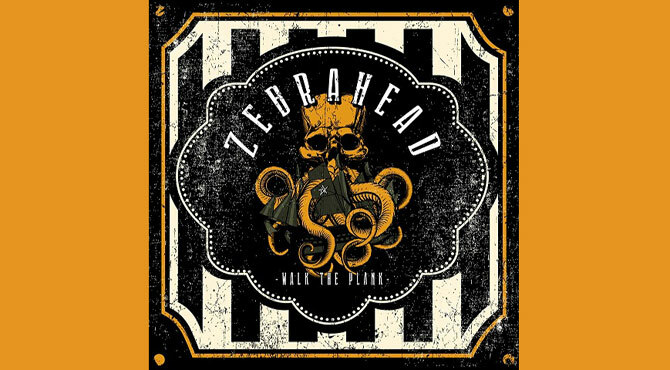 It is punchy and contains a combination of elements which showcase Zebrahead's true ability to write good music. 'Keep It To Myself' is a catchy, typical pop-punk tune, with the drums and infectious lyrics taking the lead. Zebrahead also deliver on the angsty side of things with 'Wasted Generation' which is a powerhouse of a song, full of intense rhythms and raw, angry vocals. The frantic drumming and screaming guitar solos indicate the creation of a perfect song to perform live - the type that would send the crowd wild. Alongside the loud, riff-filled side of the album, we're also given a taster of a softer-rock mixed with pop melodies in the form of 'So What'. The chorus of the song is almost a nod to Simple Plan's 'Summer Paradise', but better. The song is laid-back and it might even have the potential to creep its way onto our radios. Title track 'Walk The Plank' has a Yelawolf-esque sound during its verses, but this quickly fades away to a chorus so catchy, it could prove to be a fan favourite. The album as a whole mixes elements of heavy punk with pop-filled hooks and, although there is an element of nostalgia, it is possibly one of their best records to date. The beach vibe that the album creates brings the listener back to the summer and makes them wish they were laying in the sun, cocktail in hand. It's cohesive and full of energy; exactly what we wanted to hear from the band and more.